McBlog: On “Bricks” and Hand Pumps: Musings on New Technology. 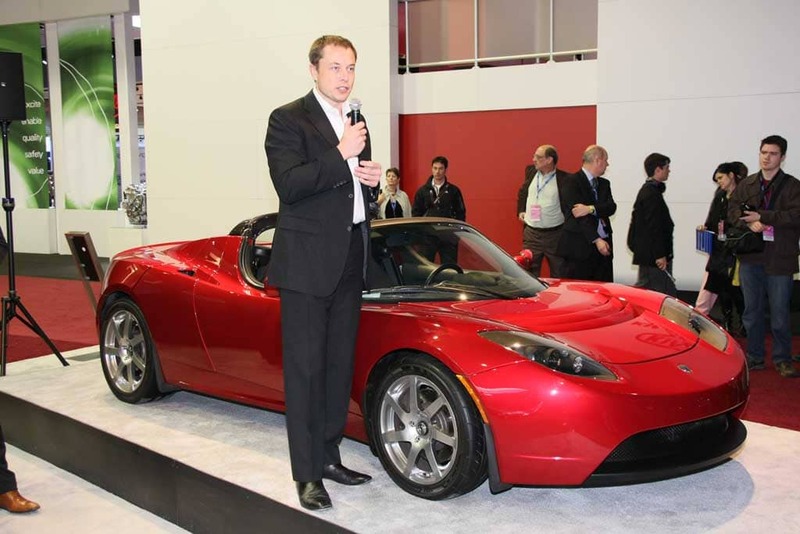 You break it that's your problem, says Tesla founder Elon Musk, shown here with a Tesla Roadster with a working battery. Editor’s Note: Battery-carmaker Tesla has been roiled in controversy as it turns out customers can turn their car into a virtual “brick” by failing to keep the vehicle charged. We asked our intrepid correspondent, Denise McCluggage to muse on the risks of cutting-edge technologies. Range anxiety doesn’t relate just to distance any more but to time as well. If left too long without an incoming charge a Tesla will become, gasp, a brick. What’s too long? Depending on juice level when you park the car “too long” can be as little as a week. “Brick” is not exactly a term an owner is keen on associating with his $100,000+ car. Yet brick is a Tesla Roadster’s destiny if the person in charge of its well-being is ignorant of battery technology and fails to realize that inattention and time can turn his car into an oblong lump incapable of even being towed without draconian measures. In brief, if the batteries in the Tesla are allowed to discharge completely they are useless. As in dead. Dead as in they cannot be recharged. Furthermore the car with the useless dead batteries cannot even be rolled out of the way, onto a truck, into a garage. It is a brick. A big costly brick. And replacements for these prematurely deceased batteries cost $40,000. Furthermore that cost is not covered by any warranty from the company or any existing insurance policy from anyone. Tesla, it seems, is not bending over backward to please wayward owners who didn’t pay attention to the owners manual. The facts of brickdom in a Tesla Roadster has been reported in the plural (maybe five known bricks) by blogger Michael DeGusta who is actually on a waiting list for a different Tesla model, the Model X SUVish one. DeGusta is aghast. He thinks the company is less than adequately active in warning owners of the dire consequences of not providing their parked Tesla Roadsters with a juice source to suckle. But John Voelcker of Green Car Reports, in an “aha” sort of story headlined “The Tesla ‘Bricking’ Story Might Just Be An Angry Owner’s Warranty Claim,” writes that the company insists that warnings are “prominently” called out in warranty and owners literature. In other words, read your manual. Who knew it could be that important. A Tesla owner named Max Drucker apparently did not know and now he’s trying to shame Tesla into taking responsibility for his own shortcomings – or so I gather that’s Voelcker’s defense of Tesla. I am, however, unused to seeing a belittling word like “just” in association with a $40,000 loss, so I checked to see what it was that Tesla told its owners. And I’m with DeGusta on this: the words are there but the incredibly grim, horrible, disastrous results of ignoring the words are not all that clear. Not even as clear as the pidgin-Japanese warning with an electronic gadget I ordered recently. In capital letters with margins replete with red skull and crossbones I was warned “NOT DROP THIS BOUGHT ITEM IN WATER!!! !” I understood such forbidden action would put me out $4.99 plus shipping. Tesla folk, facing a $40,000 loss, got no red skulls. In a Tesla communique issued since the bricking splashed the internet it is correctly pointed out – the meandering purpose of my piece here – that, in short, all technology has its no-nos. Users should learn them. For instance, Tesla says, a conventional gasoline engine must be provided with adequate oil or it will be destroyed. Oh-oh, Tesla people, a confusion here. You are ignoring the difference between active and passive risks. Permit me another personal anecdote to point out how I learned this lesson. In my days of occasionally riding motorcycles and frequently racing sports cars I recognized that conventional wisdom held these pastimes to be perilous. I acknowledged the dangers, chose to reduce their possible impact on me and accepted them. In those heady days I also tried sport parachuting, then truly new on the sporting scene. I knew immediately as I stepped out of the small Cessna into unsupportive air I was in alien territory quite different from my familiar pastimes. Thusly: for me to be at serious risk in racing something had to go wrong – a tire down, a piston thrown, another car running into me. In this new sport I was dead as soon as I left the plane and something had to go right to save me. A silk umbrella had to blossom properly out of my chest and back pack and I had to avoid being re-introduced to earth’s surface in the midst of a large body of water. The dry oil sump is analogous to the risk of racing and the parachute jump, by golly, is the Tesla. To destroy the gasoline engine someone has to actively drive it when there’s no oil in it. To ruin the Tesla it simply has to sit unattended past its Charge By date. To keep a Tesla from meeting its natural sad destiny someone has to act. Has to provide it with a reliable, adequate supply of electricity. And keep doing it. Operative words “adequate” and “keep doing it.” One Tesla was bricked while plugged in and thus believed to be safe. Except its charge had to traverse an over-long extension cord and by the time it reached the Tesla it wasn’t strong enough to feed the Tesla. Alas, time has its way and — brick. Message: even a fully charged Tesla Roadster if you do not keep the electricity coming will – over time – go to brick. Another Tesla having been shipped to Japan could not be connected to the grid there (duh) and completely ran out of juice and time and died a $40,000 death. The question arises: Why is normal use with the Tesla so close to abnormal disaster? Some have suggested that Elon Musk, Tesla’s man at the wheel, wants bragging rights for the highest range numbers for a battery car and thus leaves little safety margin. Possibly. But he must realize that adverse publicity for any electric vehicle hurts the entire field of EV transportation. In my experience only a few car buyers are people keen on specifics. Most deal with generalities and half-understood answers to vague questions. And all they know now is that they heard something bad about electric cars. Pull a face. Not for me thanks! That’s why the battery fire of a test-wrecked Volt, actually inconsequential to the real-world use of a Volt, created such a ruckus. The folks with a politically-motivated anti-electric agenda are still kicking this football all over their playground. Nonetheless, attention must be paid. As the point of this piece peeks out here and there: new technology requires new awareness. If you are considering a Leaf, Mitsubishi “i”, Tesla or other plug-in car that is dependent entirely on electric power then you must acquaint yourself with the ways in which it differs from the old hand pump at the sink. Update your software regularly, check out user sites on the web to learn about quirks the official sites might ignore and keep your mind open. If you are not prepared to do this then wait a few more cycles of discovery before you get the diamond lane denizen you crave. Based on recent news Tesla requires more attention than most both because of its lordly price and its poor history of customer service. And its battery pack design. Though both the Nissan and the Tesla rely on lithium-ion batteries Nissan uses a more conventional pack (once dissed as “primitive” by Tesla’s Musk) while Tesla uses a clever, though scarcely breakthrough, arrangement of some 6800 batteries more at home in a laptop. The Leaf, Nissan reports, has a designed-in safety floor in its battery system. They say its batteries will not discharge beyond this floor and thus cannot totally discharge. Though a touch of skepticism even here might be protective. The type of lithium-ion batteries Tesla uses have been known when in the more familiar setting of a laptop to burst into flames on more than one occasion. Maybe this penchant prompted Tesla to develop a sophisticated monitoring system to keep the multitude of mini batteries operating properly without the risk of inopportune combustion. However the monitoring requires that the batteries are always on. And always on means at least a slow discharge is always happeing. In that on-going discharge lurks the risk, as some Tesla owners have been horrified to discover, of the heartbreak of bricking. In the reported bricking episodes it appears to me that Tesla has come across in as unduly defensive and less than sympathetic. Righteously it has pointed out how many warnings are scattered through the Roadster literature. Yet this, at the same time, points up the strange inadequacies of those warnings. Particularly given the severity of the consequences. It’s likely Tesla will face some litigation from irate brick owners, which has some poetic justice given the litigious nature of Elon Musk (not – by the way – my favorite character in the car biz.) Recently an English court ruled against him in his suit against the TV show Top Gear. The show’s typically taunting review was less that benevolent toward the EV from the US. Musk’s main complaint was that a crew was shown pushing the Tesla away from the test track to a garage with the implication that the car had run out of charge earlier than Tesla’s forecast. That this would irreparably harm the Tesla rep in the public’s view was, I gather, the crux of Musk’s unconvincing claim. Oh my. When the bricking reports burst upon my computer they prompted in me a thought tinged with amusement and – I sadly admit because it is unbecoming — a touch of Schadenfreude (see not-my-favorite above.) It was my smug little notion that the reason Musk knew the batteries were still charged in the Top Gear Tesla was that the car was being pushed by a handful of guys. It takes a bleeding crane to move a bricked Tesla. 1) “Depending on juice level when you park the car “too long” can be as little as a week.” That would be if you parked your car at 0% SOC after numerous warnings and messages in the car including loud beeping. Anyone who parks a car like this at empty probably shouldn’t own it to begin with. It is very clear in the manual to absolutely not let the SOC (state of charge) go to zero and if it does, you must immediately plug it in to avoid ‘permanent damage’ to the battery that isn’t covered under the warranty. Read the manual again. What isn’t clear to you? Tesla also makes it clear with every service and when you buy the car that you must keep it plugged in, especially if it will be in storage. It also clearly gives an estimate of how much the SOC will drop each week. Max Drucker started with a 25% SOC and didn’t come back for over 2 months. With the 5% SOC drop each week that is in the manual….you do the math. Obviously this was too difficult for a CEO of a tech company to do. 2) You do know that the original ‘blogger’ DeGusta is friends and business partners with Max Drucker, don’t you? Hardly an impartial third party. Other than his blog, where is your journalist proof that there are 4 other ‘bricked’ cars? I’m not saying there can’t be but try doing some journalism and check your sources independently of this disgruntled owner’s friend and his blog post. Do you actually own a Tesla? I do and they’ve been amazing. The best customer service I’ve ever seen with a car company. Nissan also says you must plug it in within 14 days of the SOC going to zero. No different. Your larger point “Nonetheless, attention must be paid. As the point of this piece peeks out here and there: new technology requires new awareness.” is accurate. People can’t mindlessly drive an EV without some basic understanding. Just like people learned you can’t leave a plasma TV on a channel with a static banner for days on end and not get burn-in. Tesla made it very clear (and even has you sign a document saying your read these warnings and understood that you must keep the car plugged in and from going to and staying at 0% SOC). Where was that in your article? Please, you’re only adding to the ‘politically-motivated anti-electric agenda’ you criticize with this article. Again, your larger point that people buying new technologies must pay a little attention is valid. Tesla was very clear about the dangers but obviously not enough for Mr. Drucker. How someone who owns a technology company ignored all the warnings, didn’t read the manual, and didn’t understand basic battery maintenance is beyond me though. The flip side is Tesla contending that buyers of conventional vehicles should already know that attention to the details in the manual are critical — pointing to instructions regarding regular oil changes. Barring someone completely letting the oil run out, ie through a leak or bad rings, I have yet to hear of a gas engine being “bricked” because the oil wasn’t changed at, say, 6,000 miles. Other than something catastrophic, complete failure just is not something buyers have been familiar with and despite what Tesla has done with its warnings they arguably do NOT go far enough to truly make it clear that the problem is as potentially fatal as things have proved to a handful of owners. It is a completely different mindset and one that probably requires even more dire warning than Tesla currently issues. I cannot speak to what happened in the dealer showroom but I would suggest that this is a critical issue that dealers should repeat on several occasions, especially during the hand-off after a sale. I happen to agree that Tesla has complicated matters by using virtually no pad at the low end of battery range. When the battery says “0″, that’s pretty much it. The folks at Nissan (and GM and Mitsubishi and Toyota) will tell you that they recognize the likelihood that consumers WON’T fully recognize the potential problem — which is one of several reasons why they opted for larger battery packs for a given range than Tesla. On the Volt, for example, I believe they’re currently using just 10 of the 16 kWh. Leaf isn’t accessing much more of its 24 kWh. Tesla seems to have taken the strategy of maximizing stated range and hoping that buyers will be more careful in battery maintenance. This strategy is in question. The fact is that should a Volt or Leaf owner hit zero, they’ll actually have a lower likelihood of bricking because of the pad. Meanwhile, I can think of numerous situations where a person might not have the option to immediately recharge, especially with so few public chargers available. I think very few people understand the SOC drop-off dilemma. I can’t recall that ever coming up in conversation, including serious discussions I have had with Elon Musk himself, unless I initiated the topic. Wow, they’d look like heroes, they’d get the message out and they’d make it clear they were not going to just stand behind people endlessly for avoidable risks. Sadly, in recent weeks I have had a number of conversations with Tesla owners and others following them (emphasis: including enthusiasts) and the general consensus is that this is a company that does not get customer service. Ask about how they are addressing the used Tesla issue, BTW. That’s informative. As to Drucker and DeGusta, yes, I — as was Denise — am well aware of their relationship. It would have been appropriate for DeGusta to reveal that relationship. The facts are still the facts, however, and in the end, the issues center, as much as anything, around Tesla’s battery strategy and their customer service policies — while also raising questions about owner responsibility. Looking forward, I find it worrisome that this can happen and think that if Tesla maintains the limited battery pad strategy when its vehicles go mainstream the bricking issue will become widespread. Be honest: do you think blaming the consumer — even if that’s accurate — will work to Tesla’s favor once Model S is out there? Hardly. Tesla owners clearly need to learn from this. So does Tesla. But the attitude I have seen from the maker suggests they may not be interested. I have had nothing but positive experiences with Tesla and all of the other owners I know have as well. That doesn’t mean of course that there haven’t been people unhappy with Tesla’s service. I think Max Drucker kind of painted Tesla into a corner by first basically threatening them in his letter if they didn’t replace his battery for free then following through with that threat by having his friend write that blog post and unleashing all of this bad PR. If Tesla then replaced his battery, they could be liable for every single claim regardless of customer responsibility in the future. How would you suggest Tesla draw the line on owner responsibility for their battery pack? He parked his car at 25% and left for 8 weeks. If I parked my car at 15% and left for 6 weeks with the car unplugged, would I also be covered? Tesla had clear guidelines in the manual and on the agreement and decided to stick to it right or wrong I guess. I agree that it might have been nice if they had worked it out. I think Max Drucker’s attitude and anger came across in his letter and didn’t help lead to a workable solution. He also didn’t take any personal responsibly in the letter or provide a counter proposal from what I can tell at least. I think you’ll find very few cases, if any others, like this with Tesla. They have gone out of their way to help owners even replacing an entire frame with one month left under warranty (Tesla Service saw the crack and brought it to the owner’s attention. The owner didn’t even know about it). They could have easily looked it over until his warranty was out. I think bringing up Drucker and DeGusta’s relationship in the article might have been a good idea since that could provide motive the DeGusta’s blog even though facts are facts. He never provides proof of the other 4 ‘bricked’ Roadsters but obviously knows the details of his friend’s Roadster. The Roadster does give owners access to much more of the battery pack than more recently released EVs and the Volt. This allows for the better range but also means the owner must be more careful. Tesla is taking the slightly more conservative approach with the Model S and it looks like they stop at 5% SOC. From their blog post, it appears the owner can even override that last 5% but I’d imagine they’d have to click on some agreement on the screen stating that they understand they can ruin the battery pack if they go too much further without plugging in. I think Tesla will be even more clear and straightforward with their new battery agreement and wording in the manual. I’m sure they’ll now make it abundantly clear when you buy the car and when they deliver it that you must not let the SOC reach 0% and stay there or you can destroy the battery pack and that it is not covered under warranty in those cases costing the owner potentially tens of thousands of dollars. That should take care of 99.9% of owners. There will always be people who find a way around even this level of safety. I’m sure Tesla will do their best and take it on a case by case basis. EVs can’t yet be abused to the level of gas engines (in terms of lack of maintenance of the battery (in the EV) versus the engine (in the ICE) but that’s a matter of time. That doesn’t mean that there is much to worry about with the Model S or that it won’t be an excellent car for Tesla. Thanks. I drive my Jetta so little now that I didn’t even realize that for my warranty to be valid, I had to bring in my car for the 20,000 mile service even though I was only at 14,000 miles since it had been one year since my 10,000 mile service. They told me that they were going to void my entire warranty if I didn’t bring the car in so I did. I bring this up to show that all car manufacturers have things written into their warranty and if the owner doesn’t follow the rules, they can’t expect any problems to be covered under warranty. Of course Tesla needs to go the extra mile as a new company and I think they already do that. Well, as I mentioned earlier, there’s a big difference between being told to get your car in after a year to maintain the warranty and being told that after a few weeks your car is going to turn into a brick with the factory refusing to stand behind you. And, as you mention in one of your latest notes, being a few thousand miles (or even a month or two) late isn’t likely to cause that failure. While I might question some of the details of the story and even how Drucker and DeGusta handled things, I just don’t believe Tesla has taken the right approach and from my own contact and what I hear from others I still believe the company has a LOT to learn about working both with customers AND the media. I am glad to see there’s more pad with the Model S, though even then a 5% SOC is probably a recipe for disaster considering that if this vehicle really does go mainstream a lot of folks simply won’t understand. Tesla dealers will have to all but handhold buyers to ensure this isn’t a problem. Again, this is the smallest pad of any maker I know. GM is 40% of totally battery capacity with Volt, Leaf is in excess of 20%. Meanwhile, there is good technology out there to ensure that when a vehicle gets even close to drained it 1) does everything to call attention to that problem and 2) does everything possible to disable all draining of the battery until it is recharged. I am not confident Tesla has gone far enough with shutting down all power drawing systems. I am hoping you are right about how long the Model S and X can stay unplugged, though I would also hope that 50% is not the safe cutoff. It should be able to tolerate a significantly lower figure for at least a month or so to ensure that bricking is a rarity — or non-existent. Tesla has chosen with the Model S to provide a good buffer against neglect but still provide great range. Since 99.9+% of customers in my opinion would never let a car sit for a year without plugging it in but drive their car every day, they’d rather have the extra range. Do you think someone who ignores their car for a year is more responsible than someone who ignores it for 2 years? Where would you draw the line? If Tesla provided a 40% pad, people would critize them for selling a $60,000 car with the range that’s equal to the Leaf. This would all be so Tesla could protect the car from that one owner in 10,000 or more who can’t figure out how to read the manual or bother to plug their -Electric- car into an outlet once every year or more. It is impossible for Tesla to design a system where they make this problem non-existent but they have made it a rarity with the Model S I think. There will always be people who ignore every warning and trash their car and Tesla can only provide so much time and warning to these people. Are you assume people are going to be driving everywhere down to 5% and then leaving their car on the side of the rode for a few months. Who would leave their luxury car abandoned? That should be more than enough time in all but the worst case such as a hurricane hitting the city destroying everything on site and the owner ends up in the ICU for months on end with no one to check on the house or car. Could that happen? Sure but then there are probably bigger problems in that case than the car. 50% is the safe cutoff for people wanting to leave their car at the airport or storage for a year. But really, who would do that? As I said, you can’t protect against every conceivable scenario. You can burn through oil due to temperature of the engine in an ICE. The kid of person who would ignore their car for a year without plugging it in a single time is also probably the person who wouldn’t bother to ever change their oil. If that analogy doesn’t work for you, someone at TMC mentioned timing belts as something that if you don’t change can also ruin the engine. Why are you not confident Tesla has not designed systems well enough to protect the battery? You said previously that there is no way Tesla could hit the 300 mile range without at 110 kWh battery pack as well. My point was that if I had ignored that call, my car may have worked but the warranty would be void a for 2 years early. Company’s have warranties and they usually stick to them. Do you expect Tesla to accept all warranty claims regardless of level of owner neglect? Drucker did more than a few weeks. He parked his car for 2 months without charging. Really, the key here is simple. If you’re going to park your car for an extended period of time, plug it in! This does not mean you can’t go the airport on a 2 month vacation and leave your car unplugged. You can, especially with the Model S but you can’t drive your car until you hit 0% right as the pull into the parking lot, ignore all the warnings saying ‘plug your car in now’ and then go on your vacation. Tesla can only do so much. People talk a lot about personable responsibility these days but in Tesla’s case, it doesn’t seem to apply. They are designing an excellent car that provides maximal performance while offering a significant safety margin. It’s a much finer balance than the other companies offer (they are heavily weighted towards the safety side). For those people worried that they can’t plug their electric car in but every few months to a year then those might be the electric cars for them. For the people who are used to plugging their mobile phones each night, who have a garage and can install an outlet and who can do simple math and calculate how many months they can leave their car at the airport unplugged based on its current state of charge then the Tesla is probably right for them. I do get your point, but, if anything, it actually reinforces mine. It’s not something folks are used to, the idea that NOT driving a vehicle can be risky. That’s just counter-intuitive for those who haven’t fully embraced the huge number of small to large differences between technologies. And, let me stress, it’s one of the things that will make it more difficult to win over a mainstream audience. Underscoring this issue by battling with one or even a half-dozen buyers is just dumb on Tesla’s part. It only: 1) re-emphasizes that these things are a headache (I’m talking from the skeptic’s point of view); 2) that they can have serious problems not normally seen, nor under the same circumstances, as a gas car; 3) that makers like Tesla don’t have a clue — or worse, don’t care — about customer service. There have been other excellent products, automotive or otherwise, killed for precisely these reasons. I agree. Every new product category takes consumer education and people getting used to the transition. No transition is easy and I’m not saying it will be. It doesn’t mean they don’t have a compelling product and one that serves the needs of many people. You assume that owning it will be a headache. Speaking as someone who owns an EV and drives it every day, the small headache of having to remember to plug in pales in comparison to having to go to the gas station and fill up with $4 and maybe $5/gallon gas soon. Once people figure out that they leave home with a full ‘tank’ each morning (something you can’t do with a gas car without going to the gas station each morning), they’ll warm up to the idea. People used to complain about having to remember to plug their mobile phone in each night but now it’s just another daily ritual for most people. Granted the cost of a mobile phone is not a car but the point is the same. You get home, you plug it in. Simple. All it takes is one catastrophe in the middle east to send oil prices close to $200 per barrel and these small differences will become almost nonexistent. People seem to only see the potential problems with driving an EV and none of the benefits. It’s a total package and to me and many other people, the benefits far outweigh the drawbacks. You are also basing all of what you consider bad Tesla customer service off of this one non-impartial business partner’s blog. If this were truly as big a problem as he says it is and you seem to think it will be, you would see over 8,000 people putting down $5,000 or more for a car they haven’t even had the chance to drive yet. Other than this one case, what evidence do you have that Tesla doesn’t care about customer service? I’ve never dealt with an automaker than I could e-mail a question and get a response from someone with an answer in usually the same day. That is good customer service. If Tesla simply gave Drucker a free battery, would they have to do it the next time someone did something way outside of normal care for the car? Would you then call Tesla out for poor customer service for that second case? I also haven’t seen any proof about these other 4 cases other than the Drucker blog either. If your are able to get first hand reports from these owners, that would be interesting reporting. Again, what do you think Tesla should do with their warranty coverage? How many months to years should someone be able to leave their Model S or X in (at any state of charge) and expect Tesla, which is a public company now with shareholders, to shell out $30,000 or so for a new battery? Would BMW do this for every owner who violates the warranty agreement regardless of fault? I think you’re holding Tesla to a different standard than every other car maker when it comes to fixing problems created by their owners. The Roadster behaved exactly as it said it would in the manual and in the battery agreement. This potential problem has largely been fixed with the Model S anyway. A month from 0% should be plenty of time for someone to at least find a 110V outlet and save the battery. Maybe Denise McCluggage could respond to this post and aster some of the questions raised but does she have a source for the Roadster that was bricked even though it was plugged in or any confirmation of the other 4 cases that isn’t from the Drucker article? Thanks. I meant to write ‘answer some of the questions raised’ above. not sure if you can correct that. Thanks. I will try to reach her to comment. I’m running on 0 sleep and behind on Geneva posts, however. We’re a little thin at the moment, so apologies if there’s a delay.